Words by Cate St Hill. 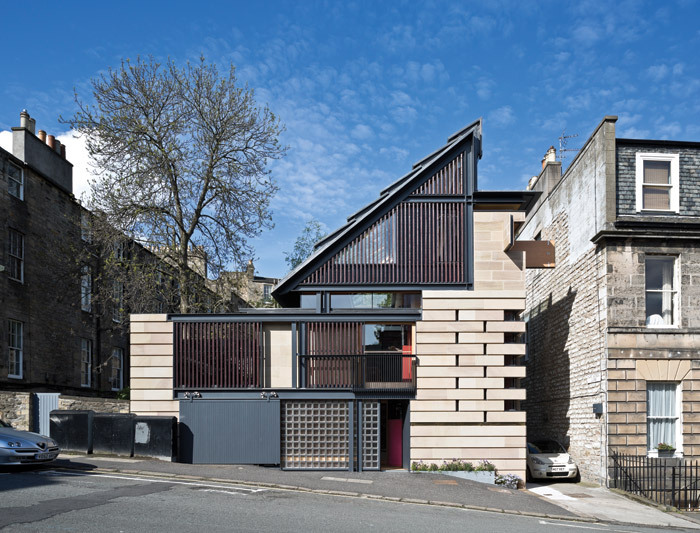 Among the sooty, greying Georgian homes of Edinburgh’s New Town, sits an unexpected, curious-looking house that angles itself to bookend a sloping, terraced block. If buildings could talk, it is weighing up a debate between old and new — at its northern corner where it faces the abrupt, rubble-clad gable end of the terrace next door, the sand-coloured stone mimics the heavy, ashlar stonework blocks of the terrace. Corner pieces, like in a game of Jenga, have been removed and shifted to allow small, glazed slots to disrupt the facade and mark this out as a new addition. Indented into the light stonework, a contemporary, dark-grey, steel frame forms the bulk of the building, a nod to Pierre Chareau’s Maison de Verre in Paris, with a glass-block wall marking the red entrance of the house. Layered on to this frontage, thin, burnt wooden batons contrast with the solidity of the stonework — it’s architect, Richard Murphy, calls it ‘an inhabited ruin’, as if this structure had been slotted into the shattered remains of a pre-existing stone edifice. For Murphy, who set up his practice Richard Murphy Architects in his adopted city of Edinburgh in 1991, it’s a fusion of a lifetime of influences and inspirations — a melting pot of homages to the Arts and Crafts and medieval Scottish architecture, tributes to John Soane, elements from Frank Lloyd Wright, details from Carlo Scarpa and traces of Adolf Loos, all tightly packed into the restrictive 66 sq m footprint. 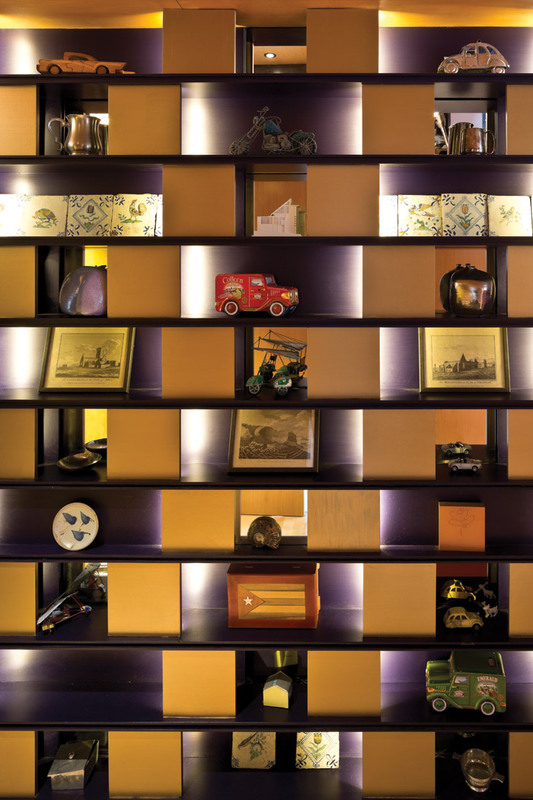 It’s a fascinating, complex home full of clever details that delight and unfold even more unexpectedly within. 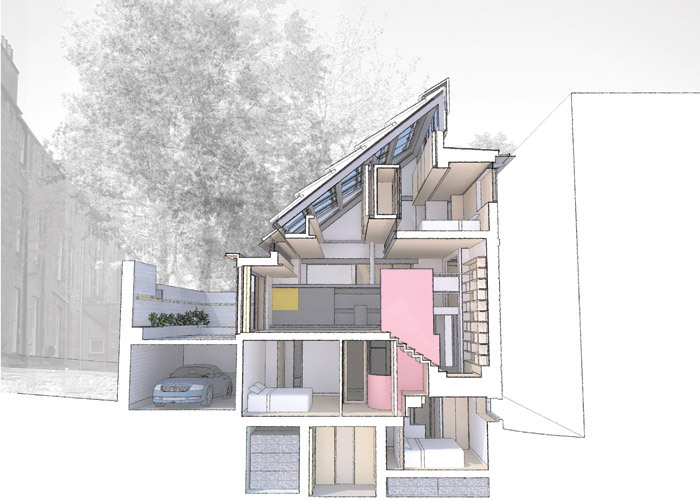 Murphy freely admits that the house is ‘perhaps over-designed’ for such a small project. Murphy first came across the site through a friend of a friend who was selling the basement flat on the corner of the New Town’s Hart and Forth streets along with its already subdivided garden. The plot straddles two unresolved estates, built in the 1820s seemingly without much coordination between them, resulting in a kink in the street and the gardens of Forth Street backing on to the gable end of Hart Street’s block, instead of ending neatly in a corner building where the two streets meet. Murphy’s monopitch roof now gives the terrace an end, allowing light into the adjacent basement flat while maximising the limited space and creating a south-facing surface for a series of solar panels. ‘In our work we try to make architecture of its time and of its place. This couldn’t be anywhere else, it’s absolutely locked into this site, but it’s contemporary and does talk across 200 years,’ says Murphy. The design was recommended refusal by Edinburgh’s planning department but councillors voted to reject this advice.Just as planning was achieved in 2007, the recession put the project on hold, giving Murphy four years to ‘fiddle around’ with the design. ‘It was a paradoxical stroke of luck in a way, that time was probably well spent,’ he says. ‘The house is so tightly designed that one thing tends to impact on another. 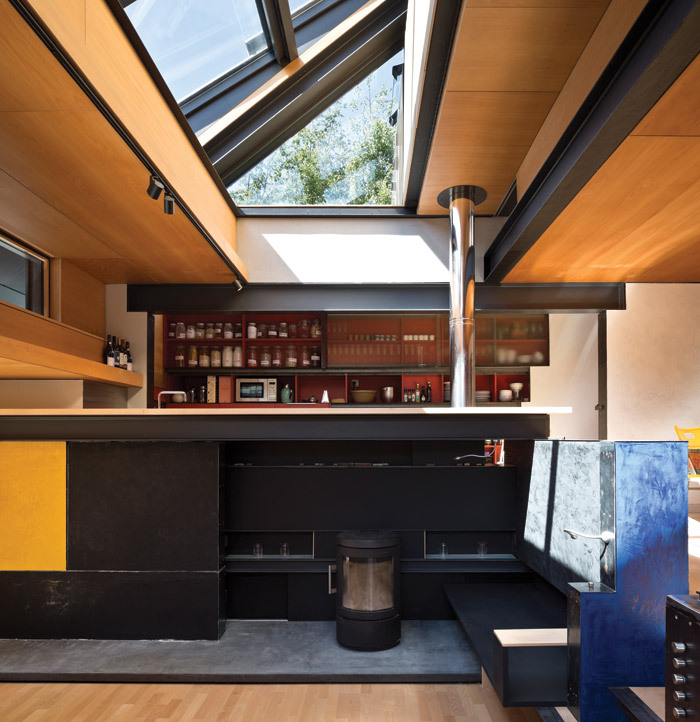 If I had a problem, I would spend a lot of time trying to think of every single solution that was available.’ He had already had a chance to road test some of his design ideas previously — this is the fourth house he has designed for himself. The land sale fell through for the first, but the other two were mews houses built in the Nineties on similarly tight sites on nearby Calton Hill. Building work eventually finished in 2015 and the house won the RIBA 2016 House of the Year award in December last year. 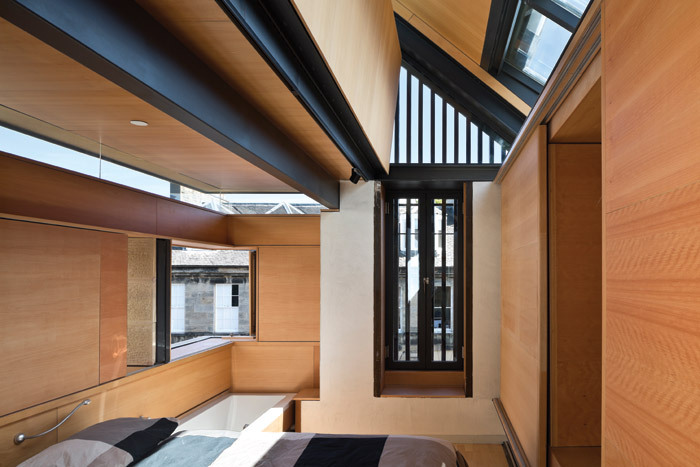 Inside, Murphy has cleverly shoehorned in four storeys and nine different levels on to the thin, 6m-deep site, stacking together three bedrooms, three bathrooms, a living space, kitchen and separate study, with a roof terrace, basement storage, garage and utility room. 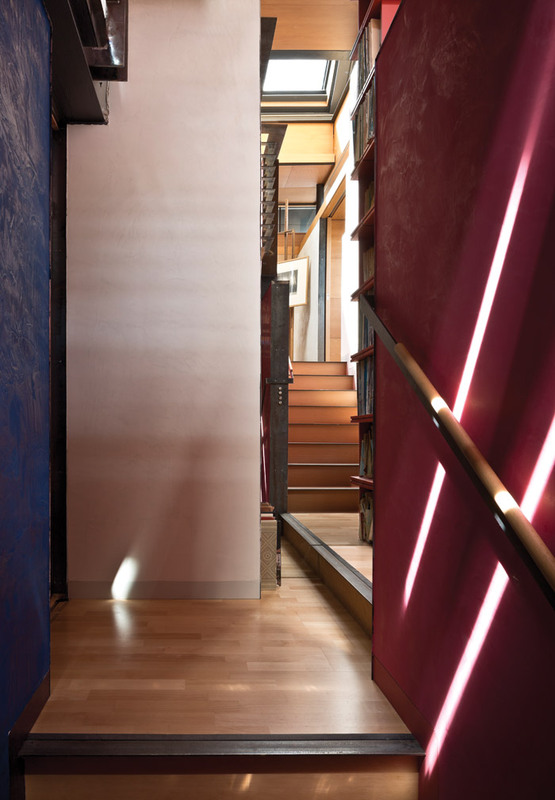 It is a lesson in the broken plan and split section, rejecting the simple form of the open plan in favour of a complex circulation route that opens up and takes you on a journey up through the house in completely unexpected ways. While he was designing the house a chance visit to the restored, split-level Müller house by Adolf Loos in Prague cemented this approach. Loos’ concept of Raumplan or ‘plan of volumes’ interconnects rooms, utilising steps and varying levels to frame views and pause the journey through the house. Rooms are visually connected from one level to another by glass panels while clever tricks learnt from Soane give a sense of depth and space (Loos also used mirrors in alcoves and above vitrines to fragment and extend spaces). A cabinet of curiosities in the entrance hall plays with reflections; some of the vitrines are mirrors, some are holes that reach into the study next door. Climb up the stairs, past the study and two bedrooms below, and a mirror ahead reflects a set of stairs around the corner on your right and the living space beyond, confusing the mind on which way to go. Murphy says most people who visit turn the wrong way. 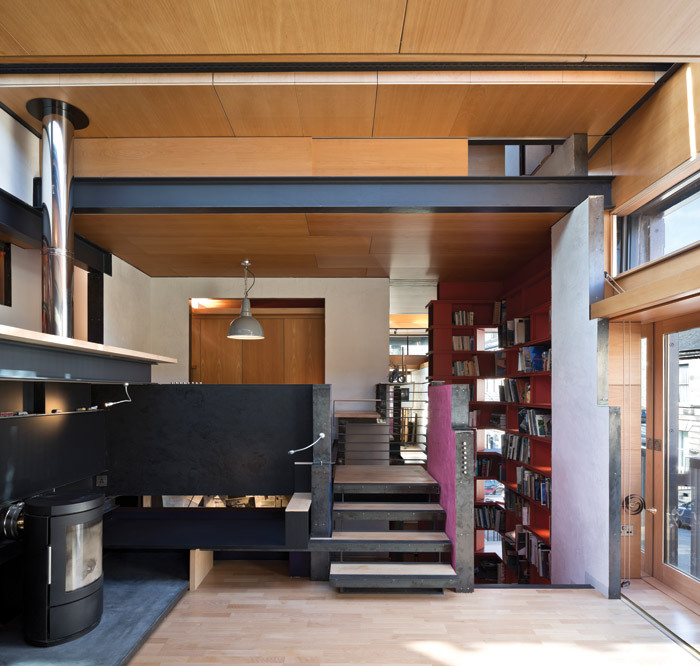 Further up, a red bookcase wraps around the staircase and features a ladder that slides on a track. Small windows correspond with the fragmented joints of the ashlar stonework on the exterior, but all is not what it seems. There appears to be a series of columns outside, but in reality there aren’t any at all, it’s just another play with mirrors. If you’ve gone the right way and not walked into any walls, you’re rewarded by a large livingroom that breaks off into a dining area tucked into an alcove and a narrow, galley kitchen looking on to the space from a balcony. The steel structure is exposed and the walls are coloured Venetian plasterwork often used by Italian architect Carlo Scarpa. A fireplace at the heart of the space was inspired by Frank Lloyd Wright’s inglenooks, particularly at his Usonian houses. Just like on a boat, everything is built-in and considered. The TV and a sneaky drinks cabinet are hidden in panels by the fireplace, while holes in the kitchen shoot recycling down to the bins. ‘I should have been a caravan designer,’ Murphy jokes. There’s even plans to be able to hoist up logs from the log store in the basement up through a hole next to the wood-burning stove. Murphy has used what he calls a ‘thick-wall aesthetic’ to make the spaces feel much bigger than they actually are. 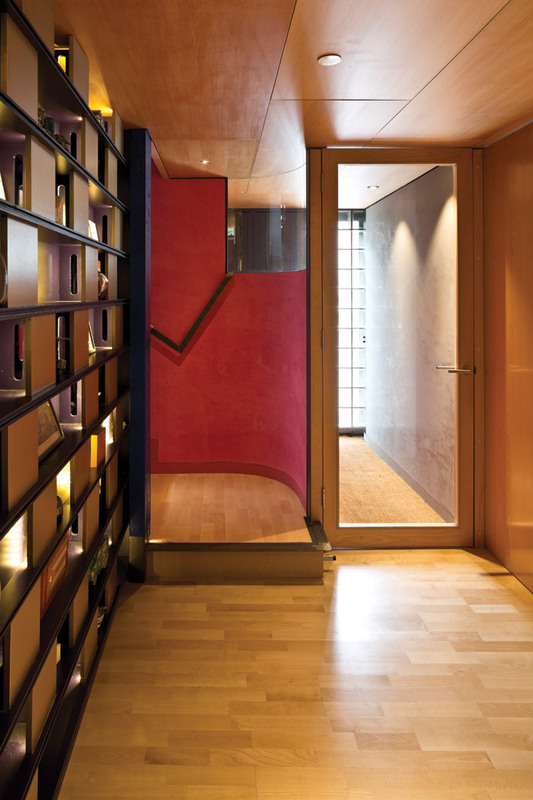 Perimeter walls contain narrow staircases to the top floor and basement bedrooms, alcoves create intimate nooks, and layers of different materials give the illusion there’s something beyond. ‘If I had gone right out to the boundary and done thin walls in glass, I don’t think it would have felt as big,’ he says. As well as a romantic notion, the idea also helps the building environmentally. The glazing generates heat for the house during the day, but the insulated panels prevent warmth escaping at night and in winter. The living space opens on to a small terrace, an homage to Carlo Scarpa’s garden at the Querini Stampalia in Venice. It uses similar concrete and the same metallic tiles from a craftsman on the Cannaregio. 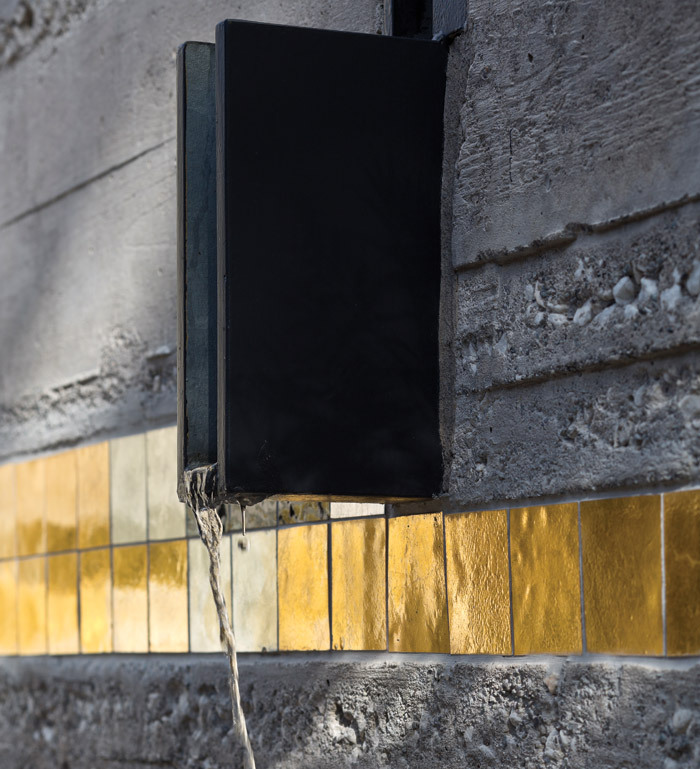 A water system, inspired by the channels and basins of Scarpa’s, collects water from the roof, filtering it down into a pond and tanks in the basement for use flushing toilets. Upstairs is the top-level bedroom and the highlight of the house. Next to the bed, a panel lifts up to reveal a bath, slide across a piece of stone in the wall above and the whole corner magically falls away and opens up. Designed using the same dimensions as the disappearing corner of Rietveld’s Schröder House in Utrecht, it connects you with the street again and brings the outside context right in. It’s ingenious.